The Gray Report: A whole meal with Sauternes: Can life be too sweet? 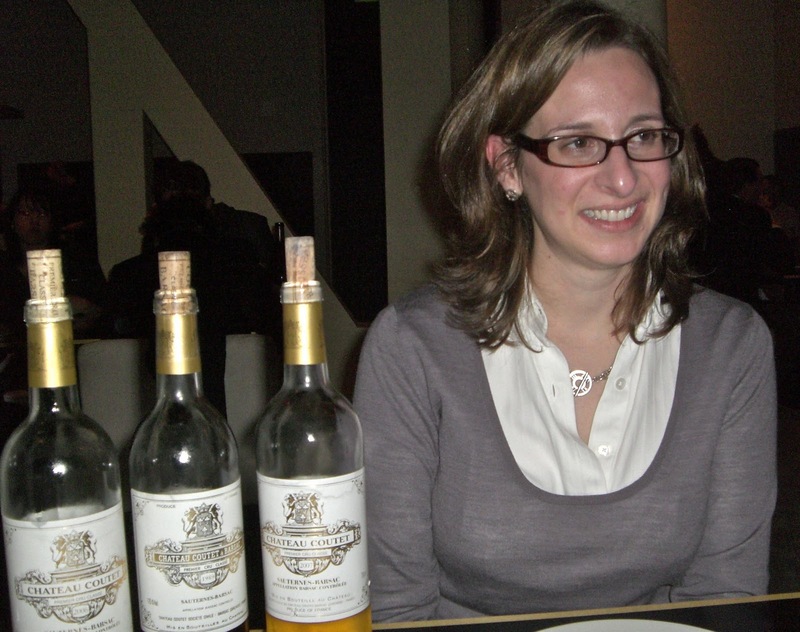 A whole meal with Sauternes: Can life be too sweet? Get 50% off shipping when you purchase 6 or more bottles of our fine wine using promo code "blake35"
Most people think of Sauternes as a dessert wine, with the famous exception that it's great with foie gras. But can one drink Sauternes through an entire meal? Obviously you can, because plenty of Americans drink Coke with dinner. A better question is, what's it like to drink Sauternes with an entire meal, with no foie gras or dessert? Aline Baly, whose family owns Chateau Coutet, invited me to Benu in San Francisco to find out. Why? Because Sauternes producers face a challenge getting their wine off the separate-but-unequal dessert wine list. Baly wants to call it "gold wine," rather than sweet wine, and she'd like to see "gold wines" get their own portion of the main wine list alongside the, er, not-so-sweet wines. It sounds like wishful thinking, but actually it makes sense. As a group, Americans are tremendous hypocrites about sweetness in wine. We talk dry and drink sweet. People claim they don't want sweet wines, but Kendall Jackson Vintners Reserve Chardonnay is consistently one of our top sellers, and it tastes a lot sweeter than many Spatlese Rieslings. And back to Coke with dinner -- you don't see that much in Europe. Baly is just suggesting that people openly order what they actually want. I let Baly do much of the ordering for me, as I often do with wine dinners. But usually the winery representative chooses no-brainer complementary dishes. Baly suggested pork belly and lamb dishes, and I was intrigued. Sadly, she had to watch me eat all that yummy stuff while eating steamed fish herself because of a stomach problem she picked up in China. And she barely had any wine, though my wife and I tried to make up for her. Baly brought 3 vintages of Chateau Coutet: a 1989, a 2006 and a 2007 ($60). You can buy the last, and best, one here. And my sponsor, which doesn't have the '07 yet, does have a good price on the 2004. The '07 was clearly the best vintage of the three: it tasted of apricot jam and honeycomb with appealing minerality and good acidity. I enjoyed drinking the '89 because of its complexity, but the '07 was almost as good now and will probably outstrip the '89 eventually. It was significantly richer and more intense than the '06 because 2007 was a humid year that allowed plenty of botrytis ("noble rot") to develop in the 95-acre vineyard. Pork belly with onion and black beans: Very good with the '07. The dish had a slightly Cuban feel and I'm used to drinking German Riesling with Cuban food, so it felt familiar. Risotto with sea urchin: You would think this would be a great pairing, but the dish was so rich that I couldn't eat it, and the rich wine didn't help. This is the only dish where I preferred the lean '06, but I would rather have not had Sauternes at all, which teaches something -- maybe rich food isn't the great Sauternes pairing we think it is? Lobster boudin: Lobster and Sauternes is a classic pairing, and this went perfectly. Mini-medallions of rare lamb: Baly insisted I order this to prove that Sauternes can go with lamb. Sure it can, as can Coke. But I would rather have drunk something else. Chicken (seemed like sous vide): This went well with the Sauternes, and Baly pounced to make one of her main points: Why don't people drink Sauternes with Thanksgiving dinner? It's true, wines with a little residual sugar work at Thanksgiving because of the sweet stuff on your plate. And Sauternes is a special-occasion wine. Keep it in mind next November. Andante Dairy cheese plate: Fabulous, especially with the '89. It's not news that Sauternes is great with cheese. But for me this was the single best pairing. I enjoyed the meal and the conversation, but I confess that my palate was tired of sweetness by the end of the night. As much as I liked the '89 and '07 Chateau Coutet, we left a lot behind. I'm glad I brought my wife and her sweeter tooth. When I confessed my sweetness fatigue, she said she experienced nothing of the sort. She also pointed out that I never actually stopped drinking Sauternes. I felt like Homer Simpson: "This hot dog's terrible. Don't I get 2 for 1 free?" Moral of the story: Sauternes is perfectly good with the entire meal. It's no less appropriate than Coca-Cola, a lot tastier, and -- for the last 107 years or so, since Coke downgraded its kick to caffeine -- a heck of a lot more fun. I think Aline may have something there. (Too bad I’m 51 and married.) Being raised in the south, drinking sweet tea or Mountain Dew with every meal, I'm conditioned to sweet drinks with food. I know you don't place great stock in the work of Tim Hanni, but as one who has a hyper-sensitive palate, I think Tim's claim that the wine industry ignores hyper-sensitive tasters at their own peril has some merit. I, for one, enjoy most dry wines more without food. For me, food works much better with sweet wines. "A better question is, what's it like to drink Sauternes with an entire meal, with no foie gras or dessert?" An entire meal without dessert! Hah! I've come around a bit to Tim Hanni's perspective, but I still think it is important for consumers to be more self-aware (and not just with wine, either). If you're raised in a culture of mass market processed food, then you are somewhat desensitized to high sugar and fat levels. It's not simply intrinsic preference; it's cultural. To appreciate dry wines and non-Americanized cuisines, many American consumers need to step outside their comfort zone. To that end, I think the wine industry does meet those needs. A large swath of mass market wines are made slightly sweet, fruity, vanillified, and without much bitter tannin. It's just that there isn't much high end wine aimed towards those with sweet and/or hyper-sensitive preferences. As for Sauternes, well, I can see it working with some foods. But why spend $50 on 375 mL when Coke is $1.49 per 2 L? I can also get Vouvray in a range of sweetness for less than Sauternes, I believe. Maybe instead of trying to change the customers, they need to change the wine. Clearly I'm insane to suggest breaking tradition, but what if they blended normal harvest with late harvest wine? Kind of like adding a bit of Muscat to a blend. Surely it would be cheaper and the wine would be more versatile.